Carnahan Insurance announces the Controllable Premium award has been given to Tower Tech Services, Inc. Located In San Antonio, Tower Tech is Texas’ premier cooling tower repair and upgrade contractor. Tower Tech was chosen for their outstanding workers’ comp premium savings. 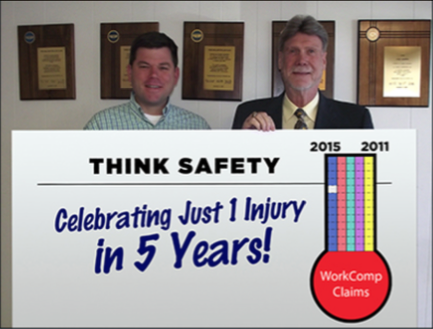 Tower Tech has reduced its workers’ compensation premium 11% over 4 years, by implementing a safety program that has resulted in just one injury in the last 5 years. Ben Gray (pictured with Jerry Carnahan) is Vice President at Tower Tech Services, Inc. (TTSI) Tower Tech has locations in both San Antonio and Dallas, and is solely dedicated to the repair, upgrade and installation of cooling towers, evaporative fluid coolers and evaporative condensers throughout the entire state of Texas and the surrounding regions. TTSI performs work on both field erected and factory fabricated cooling towers, including wood, fiberglass and steel towers.